It’s a busy week for releases and I’m sure there will be plenty of reviews and comments on various Blackest Night and other high profile books. 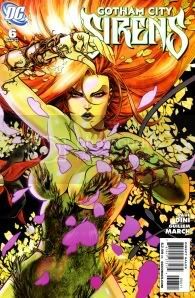 I thought I would focus on something with a slightly lower profile, that being Gotham City Sirens. The series revolves around Catwoman, Harley Quinn, and Poison Ivy finding themselves living together in the aftermath of the recent changes in the Bat Family of books. Writer Paul Dini and Harley Quinn together again was all the incentive I needed to pick up the first issue. The latest issue sees the end of a three part storyline where Gaggy, one of the Joker’s old sidekicks, impersonates the Joker and tries to kill Harley for being the girl that ruined the good times with his old pal the Joker. Gaggy’s back story ends up being a interesting look at how the Joker went from being the laughing criminal to the sadistic killler that he is now. It’s taken me five issues to confirm my suspicion that The Flash just isn’t for me. 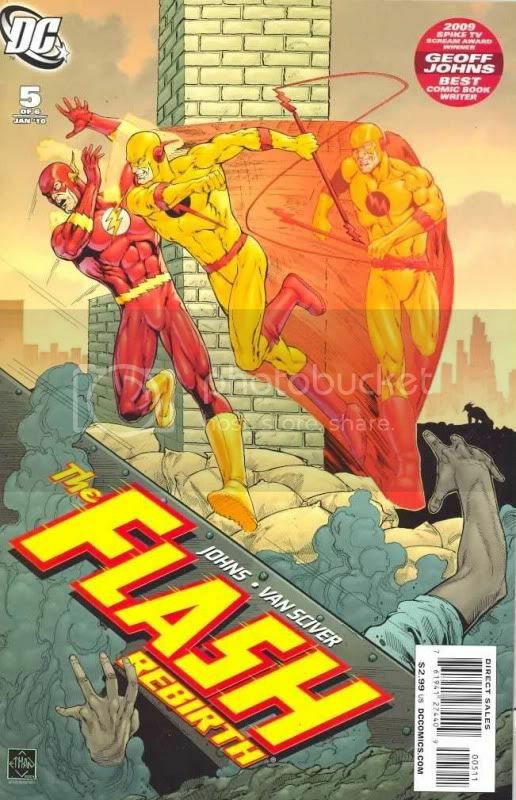 It’s easy enough to read “The Flash: Rebirth” and think that maybe The Flash is just a downright stupid character based on utter ridiculousness, but that doesn’t take into consideration the longevity of the character or the fact that there are people out there who buy the books. That’s why I have to believe that there are people out there who think this stuff isn’t moronic, and that I just don’t get it like how my dad didn’t get my fascination with C&C Music Factory in 1990. I feel like Geoff Johns is trying so hard to make this book drip with sugary sentimentality that he’s gone overboard and created some kind of comic book diabetes, in which any more sweetness will send me into fits. I get that Barry Allen is supposed to be like the nicest person ever. I really do get that. And I also have no problem with good guys who are also goody-two-shoes upstanding citizens. But I just feel like that’s all there is to Barry Allen 2009 — flashbacks to just what a swell dude he is. It’s as if his babysitting business hasn’t taken off like it should have, and DC really needs everyone to understand just how great he is as a human being. I’m conscious of my sour mood toward comics in general lately, and trying to figure out if my displeasure with this series is because of the series or if it’s just a reflection of overall grumpiness. But there are a few books out there I’m genuinely enjoying, so I’m inclined to think it’s not me. Maybe it’s funnyman Ethan Van Sciver’s art. It’s kind of intense on a superficial level — lots of muscles and cross-hatching — but it just seems so stiff and lifeless. If anything were a visual metaphor for an overly sentimental and melodramatic script about a guy I just can’t bring myself to care about, this would be it. R.E.B.E.L.S. #10 came out more then a week ago. I only just now got around to reading it and it was pleasantly surprise. This is one of the Blackest Night ring incentive books that DC has been putting out, where you get a ring from one of the Lantern Corps along with the comic. This book came with the Indigo Tribe rings. Thankfully this issue of R.E.B.E.L.S. is written with the idea that new readers would be coming on board so it makes for a very good jumping on point. You do not have to know anything about the characters or the book before reading this as the story provides all the important details and background information. 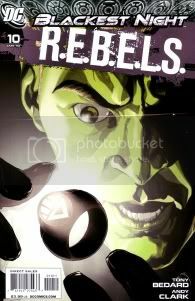 The series centers primarily around Vril Dox the son of Brainiac. He recently lost control of his intergalactic peace keeping force LEGION to Starro the Conquerer, who was revealed to be the power behind the face hugging starfish like mind controlling Starros. Dox and the rag tag crew he put together are out to stop Starro from controlling the entire universe. Durng all of this Vril Dox’s ex wife Stealth recently died in a attack by the Starro controlled LEGION robots. She then comes back as a Black Lantern being quite unhappy with Dox thinking he was to blame for her death. The back story proves to be quite interesting and everything is told well. Andy Clark’s artwork is beautiful on this. It is not only great from a technical standpoint but the facial expressions in his work really breath life into the characters. It’s not affiliated with the official Comic-Con, but a local organizer is building on San Diego’s reputation as a happening spot for conventions. With four-day San Diego Comic-Con International passes unprecedentedly selling out in early November, does San Diego need another con? And four times a year at that? If the hundreds of attendees at the first San Diego Quarterly Con last Sunday are any indication, then, yes, there is a need. “There’s a big enough collector market that still exists in San Diego and wants to come to this,” said Roy God Damm, self-professed “spokesman of the underground” and attendee at Sunday’s event. 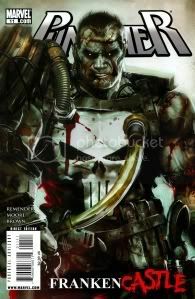 While there are many things that annoy me about Marvel one thing I have consistently enjoyed is the Punisher ever since Garth Ennis rebooted the character a decade ago. I was sad to see Ennis’s real world Max line take on the Punisher come to a end, but Duane Swierczynski did a good job of filling in before Jason Aaron and Steve Dillon relaunched the Max line book this month. I had pretty high hopes coming into this book since I am a fan of Aaron’s Scalped, if you are not already reading that I highly recommend it, and Dillon for many years now has been one of the best to ever draw the Punisher. 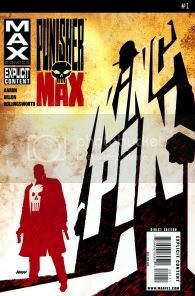 The first issue did not disappoint as it sets up what will be the Max line version of the Kingpin. Fans of the Ennis and Dillon run will like this as well for if I did not know any better I would have thought Ennis had written this issue himself. Over in the Marvel U proper Rick Remender has a very different but equally entertaining take on the Punisher. 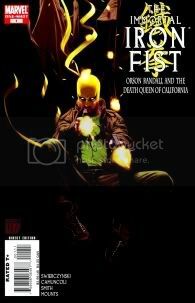 Issue #11, out this week, is my highlight of the week. It is a very good jumping on point for those not already reading as the book goes in a very different direction after the events of the List where the Punisher was literally cut to pieces by Daken, the Dark Wolverine. This issue sees a strange group of Japanese men hunting down and killing monsters of the world. Many of the monsters have taken refuge in the old Morlocks tunnels in New York. After gathering up what parts of the Punisher they can find, Morbius the Living Vampire in a Doctor Frankenstein like role pieces the Punisher back together again in the hopes that the Punisher will defend the monsters against whoever it is that is trying to kill them all. 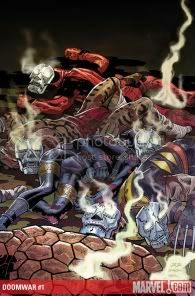 Remender has crafted a very strange but highly entertaining story. Tony Moore comes on board as the artist here and he is perfect for the job as it involves drawing Marvel’s Legion of Monsters. Anyone who enjoys this issue should also check out Fear Agent which is from the same creative team. Fear Agent also features the art of Jerome Opena, the artist of the first several issues of Remender’s Punisher. My fight with manga is now over after a rather dumb technicality on my part. I was pouring through lists of manga to try and come up with my own list of manga worth reading for someone like me. It turns out there is already a site that does this and more. The saddest part is that I came across that site a couple months ago but did not think to bookmark it. All my anger and frustration towards manga was for not. With that said I encourage anyone interested in manga to checkout mangaupdates.com. All you have to do is type something like Pluto into the search and it will bring up the information about the title as well as give you a nice long list of recommendations of similar manga. It was the one little thing I was desperately looking for. Even if that doesn’t work there is a very active message board on the site with a section dedicated to recommended reading. I can vouch for the recommendation lists in the profiles as they were many of the same titles I was interested in after pouring through the lists and reviews the old fashion way. Speaking of manga sankakucomplex.com has a very interesting post about the current problems manga is facing in Japan with declining sales. Icarus Publishing has a good post as well based on the Sankaku Complex article. This is another example of a print industry facing a digital world. 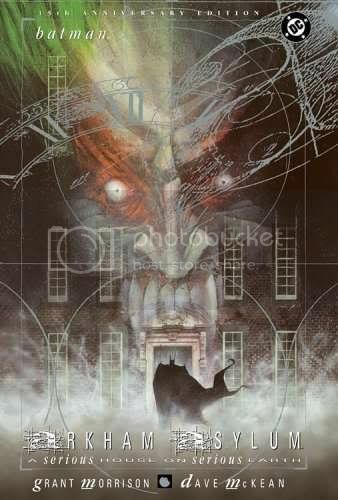 This won’t be a traditional Library of Doom review because I imagine at this point in human history, 20 years after its initial publication, there are probably few people interested in a traditional review of Arkham Asylum. Prior to last night, I was probably one of the few remaining regular comics readers in 2009 who had yet to read this book, in spite of my good intentions. But last night, I had a 30% off coupon to use, so here we go. Honestly I wasn’t all that excited by the main story. It was interesting to read, worth a little effort to think about, and somewhat pleasing to look at. I seem to have shackled myself quite a bit with this pervasive awareness of my place in the comics review timeline, but I’m just not sure I’m going to have too much to offer in terms of Unique Takes on This Story. But that’s okay, because I ended up really enjoying the book once I got to the bonus materials. For the Anniversary Edition, DC has included Morrison’s script for the book, including some contemporary notes from the author. Sometimes I skip things like this, but I was underwhelmed enough by the feature presentation that I hoped I’d get a little good out of reading the appendix. A fellow Doom, the Doctor to be precise, will be going to war this February in the DoomWar mini series. CBR has a interview with editor Axel Alonso and artist Scot Eaton about the project. To sum up Dr. Doom tried to kill T’Challa the Black Panther leading to him being gravely injured and his sister Shuri taking over as the new Black Panther. The war will be a T’Challa strikes back type thing with T’Challa and wife Storm calling on their friends from the Fantastic Four and X-men for help. It remains to be seen if Dr. Doom will call on the members of Doomkopf to stand by him in some Doomish manor. Honestly I’m not terribly interested in this aside from the entertaining name, but it is a good example of Marvel’s current stadgedy of having many smaller events instead of one big event. While it is good to see Marvel listening to the fans who complained about event fatigue after being warn out by Secret Invasion, I think they are spreading themselves way too thin with these mini events. I don’t think there is anything wrong with a big annual events as long as they mean something. The problems I had with Secret Invasion as well as DC’s Final Crisis was that I did not feel like either really meant anything in the end. DC’s Blackest Night has been a good example of an event done right with a strong lead in and a meaningful point to it all. Over at Marvel we have Dark Reign the event that isn’t called a event leading us to the Siege mini event that will see the end of Dark Reign and me feeling very tired of the the word “event.” I will read Siege but I ultimately do not care one way or another about it because Dark Reign has been so spread out that the bad parts cancel out the good parts leaving me feeling rather indifferent as whole. I do like Norman Osborn being the villain in control and would have preferred he have a longer run in that role. It will be interesting to see the sales numbers once Siege starts up next month since DC has recently taken a firm hold of the top ten thanks to the Blackest Night. Despite all the helpful information I have received this week regarding manga I still can’t shake the feeling of being overwhelmed by it. Daryl Surat of Anime World Order has been a big help in explaining why I have had so many problems. Essentially the manga translated into English has been the type geared towards boys and females. This is not to say all manga is like that but it’s easy to think that because the most popular translated manga are geared for those demographics and rightly so because those who read American comics are already well taken care of. Here are some of the things that give me problems. Like most that read American comic, I believe the artwork is very important. I personally do not enjoy the style you see in popular manga or anime as I prefer a more illustrative look to a cartoonish look. Whenever I see manga that has some combination of samurai legends, girly romances, settings in a schools, or Dragon Ball type battles I tend to tune out and go back to the American comics I know. These are the things I constantly run into when trying to find manga that interests me. This is not to say I will not read manga involving those things but it has to be pretty unique and special to get me on board.